Bison Booties are currently only available in store! Each pair of Bison Booties is handcrafted with love in Bismarck-Mandan, North Dakota. Each and every pair of Bison Booties is hand crafted in North Dakota, USA, and is a "Pride of Dakota - North Dakota Originals" product. 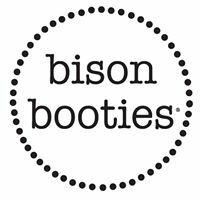 Bison Booties is a woman-owned company committed to domestic production and environmental sustainability. You’ll see these commitments in our manufacturing practices, our support of work-at-home moms, and in our use of organic fabrics and minimal, environmentally responsible packaging.